Gebiet der Hallstatt-Kultur im 6. Jahrhundert v. Chr. Größte keltische Ausdehnung, um 275 v. Chr. Die „sechs Keltischen Nationen“, in denen es bis in die Frühe Neuzeit eine signifikante Anzahl Sprecher keltischer Sprachen gab. Source Atlas of the Celtic World, by John Haywood; London Thames & Hudson Ltd., 2001, pp.30-37 and other sources (see talkpage for details). References: Atlas of the Celtic World, by John Haywood; London Thames & Hudson Ltd., 2001, pp.30-37 and other sources (see talkpage for details). 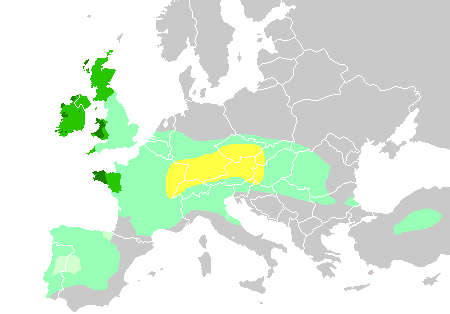 The map was originally based on the earlier uploads en:Image:Celtic europe.PNG and Image:Celts 800-400BC.PNG. These earlier maps were less accurate than this one. File:Celts in Europe-fr.svg is a vector version of this file. It should be used in place of this raster image when not inferior. Missing Celtic settlements in Friul.